With the growing effect of age, people develop several health related issues which make them physically weak and dependent on others to fulfill their routine activities. Arthritis is one such problem that takes place mainly among the aged people and cause joint pain in their bodies. People suffering from arthritis, only know how difficult it becomes for them to lead a normal life when they became incapable of even doing their routine tasks. Therefore, at Magic Opener, we offer premium arthritis aids to provide an easy living to people suffering from arthritis. Arthritis causes inflammation in your joints which further results into severe pain, stiffness, and swellings and also limit the movements of your body parts. In such a scenario, people become dependent on others and it hurt their self respect to a larger extent. Therefore, at Magic Opener, we offer superior arthritis help to provide a normal living to people. People can carry their day to day activities with maximum convenience and efficiency. Our supreme quality of arthritis aids also help people who are living without any care taker. These people are solely responsible for performing their day to day task and thus our arthritis help make things easy for them. Arthritis results in making the sufferer loose control on his own body and hence the situation badly hurts his self respect and pride. In such a scenario, our arthritis aids can serve as the best option for these people to bring them back in a situation where they can do their work on their own. Magic Opener facilitates quality arthritis aids that are specially designed to provide an easy and convenient access to people on their daily tasks. Life with arthritis becomes very difficult for people. Especially arthritis in hands impacts their ability of performing daily routines like eating food, brushing teeth, bathing and various other regular tasks. Therefore, we offer effective arthritis pain relief products that help arthritis patients in lessening the amount of pain to some extent. We also offer pain relief products for rheumatism patients. Arthritis and rheumatism cause very serious pain and discomfort to the victims which need extreme care on behalf of the patients. However to make things and life comfortable to people, we provide numerous arthritis assisting devices that can make your life with arthritis comparatively easy and convenient. 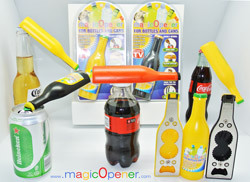 Magic Opener offers a range of products, tools, gadgets, aids and equipments that are specially designed to provide assistance to people suffering from arthritis. We ensure that by using our quality arthritis assistive devices, people can easily do their daily household activities like cooking, eating, cleaning, dressing, toiletries and various other routine duties. So live your life with pride and independence with the perfect assistance of the Magic Opener arthritis aids.